Sign up NOW to get a FREE copy of Dr. Jacobson's eBook on the 25 years of Science and Research that Support The Technology Behind Magnesphere™. There is a great deal of information that supports the premise that the human body is not only a "chemical system," but is also an "electrical" system. Neuronetic's Transcranial Magnetic Stimulator (TMS). The NeuroStar uses electro-magnetic fields in the treatment of depression for patients unresponsive to drug therapy. BioniCare Medical Technologies Osteoarthritis Knee Device and the Rheumatoid arthritis Hand Device for the treatment of arthritis. Neotonus NeoTone System for muscle rehabilitation, disuse atrophy, muscle re-education, muscle spasms, decreased blood flow, range of motion and other sports injuries. Ivivi Technologies Inc.'s targeted pulsed electromagnetic field (tPEMF™) therapeutic products which are indicated for the palliative treatment of post-operative pain and edema in superficial soft tissue. 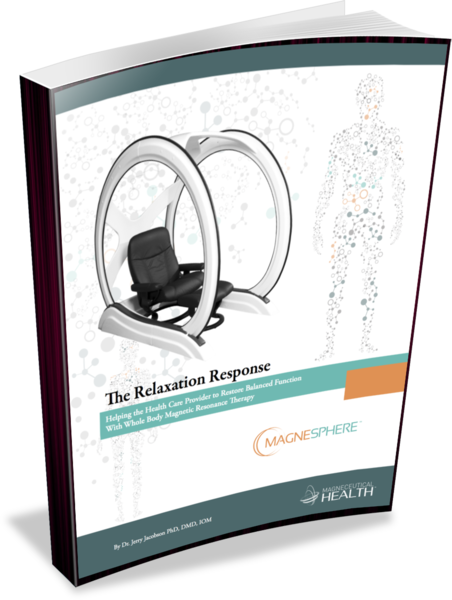 Get Dr. Jacobson's eBook that details over 25 years of rsearch and studies with the Magnesphere™ technology. Just complete the form above and it will be emailed to you now. The Magnesphere™ is classified under the U.S. Food and Drug Administration (FDA) regulation 21 CFR 890.5660. Under this product regulation the Magnesphere™ device is classified as a Class I medical device, exempt from 510(k) Premarket Submission. The FDA Product Code for the Magnesphere™ is ISA by the Physical Medicine Review Panel. The Magnesphere™ FDA product listing number is D134631." See the Certificate of Compliance. There have not been any serious medical adverse events resulting from exposure to the Magnesphere™ device (or its predecessor model, the Resonator). However, in other studies, magnetic stimulation from stronger fields has been shown to increase the risk of seizures, especially in patients with lowered seizure thresholds. If you are at risk for seizures, you should not participate in our relaxation sessions. It is possible that there are other medical risks from exposure to the Magnesphere™ as we do not know all of the consequences from its use. The FDA has not decided that the Magnesphere™ device or exposure to it is safe. It is possible that you may suffer discomfort or pain, but it is not likely. Since the magnetic therapy that is produced by this device is in the Pico-Tesla range, the magnetic energy that is delivered to the body is a fraction of the magnetic energy produced by the earth on a constant basis. There are no other hazards that the Company has identified with this device. Efficacy of the application of magnetic fields to the treatment of Parkinson's Disease pilot study protocol, APPLIED MAGNETICS, LLC. Version 1.6, February 20, 2007. IRC # 07021-02. A double-blind, sham-stimulation controlled study of the application of magnetic fields using the Jacobson Resonator™ for the treatment of Parkinson's Disease: phase two pilot study protocol. Version 2.5, Oct 2007. IRC# 07102-01. An open label extension study for subjects previously treated in either pilot I or pilot II studies of the application of magnetic fields using the Resonator™ for the treatment of Parkinson's Disease: Extension pilot study protocol, Version 4.0, March 14, 2008. IRC# 06052-01.IRC Resonator Device NSR#: DAM-003.